Following the defeat of British forces at Yorktown, Virginia, on October 10, 1781, General Charles Cornwallis surrenders to General George Washington, marking the end of major military actions in the War of Independence. Parliament retaliated in 1774 by passing the Coercive Acts, which were labeled the "Intolerable Acts" by the colonists. These laws closed the port of Boston until the East India Company was repaid for the dumped tea, restricted the powers of the Massachusetts colonial legislature, and permitted British soldiers and officials accused of capital crimes to be tried in England rather than in the hostile colony. In addition, Parliament appointed General Thomas Gage, commander of the British Army in North America, as the governor of Massachusetts. Gage was to enforce the Coercive Acts. 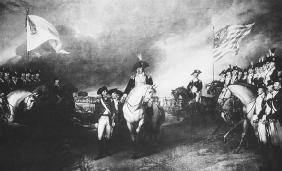 In the Treaty of Paris the British recognized the independence of the United States. The treaty established generous boundaries for the United States, with U.S. territory extending from the Atlantic Ocean to the Mississippi River in the west, and from the Great Lakes and Canada in the north to the thirty-first parallel in the south. The U.S. fishing fleet was guaranteed access to the fisheries off the coast of Newfoundland, Canada. Navigation of the Mississippi River was to be open to both the United States and Great Britain. Forty-seven years ago, the nation engaged in the war of independence in this month under the leadership of Bangabandhu Sheikh Mujibur Rahman and earned a sovereign Bangladesh on December 16 in 1971 after fighting against the Pakistani occupation forces for around nine months. Bahadur Shah Zafar not only played important role in the war of independence but also continued his war through pen until his death while in exile at Rangoon in Burma, he added. The most prominent among them is Maria Sirena, who begins to tell her trapped comrades the story of her parents and her childhood during the Third War of Independence. Bangladeshi officials say three million people were killed and hundreds of thousands of women raped during the war of independence against Pakistan. Summary: Sixty years on, the war of independence from France remains a defining moment for Algeria and its elite, like 79-year-old Zohra Drif, a senator who once set off a bomb that left three people dead. Some counties were quiet during the War of Independence but flared up during the Civil War. Records contain service pensions from veterans involved in the Easter Rising, the War of Independence and the Civil War and those awarded the 1916 Medal and The Service Medal. Abdul Quader Mollah, convicted of war crimes during the nation's war of independence against Pakistan in 1971, was due to be executed at a minute past midnight, but lawyers went to the home of Judge Syed Mahmud Hossain and secured a postponement. Synopsis: "The War Of independence In Kildare" is a comprehensive history in which James Durney illustrates the unique role that County Kildare had in the Irish War of Independence. Unless you are a world history buff, you probably do not know a whole lot about Turkish history and the War of Independence. South Sudan only became independent in 2011 and is still reeling from its war of independence and unresolved economic and resource conflicts with Sudan. DHAKA (TAP) - Top Islamist Ghulam Azam has been found guilty by a war crimes court of five counts of war crimes during Bangladesh's 1971 war of independence with Pakistan.